Here at Indietracks Towers, we’re usually awoken by the sunlight streaming through the curtains, the morning call of bluebirds, squirrels foraging for nuts, the sound of bicycle bells frightening pedestrians off the pavement, the joyful screech of a joyrider’s tyres, cats fighting viciously for territory (well, we think that’s what they’re doing!) or the next door neighbours watching horror movies at 3am in unnecessary surround sound. Mostly the last one. Today, however, it was the brutal knock of the postman. After several attempts, it became clear that the only way to cease this cruel interruption was by actually answering the door, where, lo and behold, we were presented with the first instalment of Indietracks flyers! Beautifully designed by our Emma in this season’s hippest colours (it’s all about yellow and black this year), we think these are going to adorn many a fridge door, scrapbook or those cork boards that you see in student halls of residence for years to come. Keep an eye out for them, they’ll be coming to a gig, record shop or street near you soon! And, of course, one of the names on the aforementioned flyers is today’s interviewees, Love Is All! Love Is All have picked up plaudits for their blend of art punk and indie rock since they formed from the ashes of indiepop group Girlfriendo in 2005. Pitchfork included their debut album 'Nine Times That Same Song' among their favourites of 2005, while NME named their song 'Make Out Fall Out Make Up' as a single of the week. The band’s new album ‘Two Thousand and Ten Injuries’ is an unconstrained and celebratory affair, combining punk guitars, saxophones, disco beats and melodic harmonies and is already being hailed as one of the best albums of the year. Josephine from the band has joined us for today’s interview. Hum, we're five people from Gothenburg, Sweden who have been playing together for a small eternity. We are very much in to doing things ourselves and have mixed and recorded all our music in our own space together with Wyatt Cusick. I'm making all the artwork myself and most of the videos. It's not so much a statement as it is us just being bad with trusting outside ideas. I think we can be a pain to work with sometimes. We haven't toured Europe nearly as much as we've toured the US and therefore we are really excited to play Indietracks this summer. I'm really digging the new Ariel Pink record. Such perfect music for the summer. I feel like we haven't played anywhere too exotic or unusual. We did a small tour of Brazil, that must be the most unusual place we've played. We managed to combine the tour with two weeks of vacation, which made the whole trip amazing. Exciting... I don't know. There will probably be plenty more touring and some recordings. Right now I'm mostly excited about summer being around the corner, I can't wait to go swimming and grilling and all those summery things. Johan and Markus know pretty much every Beatles song ever recorded and will sing them to you in perfect harmonies if you buy them a couple of glasses of Pastis. Ariel Pink. That's all I can think of right now, sorry. 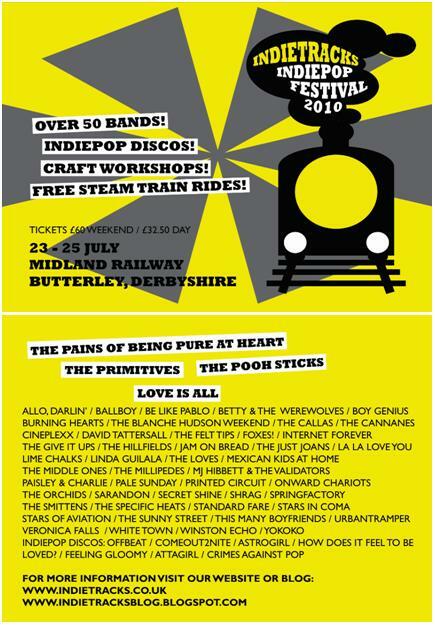 What attracted you to play at Indietracks? Last year some of my friends went and they came back talking about what a great festival it was, insisting that we should try to play there. Of course I forgot all about it, but when the Indietracks festival asked us if we wanted to play I got really excited and instantly knew that I wanted to do it.